About River Village Carpenters | River Village Carpenters, Inc.
We began our company in 1978 on River Road in Merrimac, MA. The inspiration for our name came from 19th century maps and documents, which revealed that the neighborhood was once known as River Village. Historically, the village was an important center of the local carriage making industry. Workshops clustered around the busy main pier, as the river was the link that allowed trade with distant markets. In time, trains and motor vehicles replaced carriages and riverboats, and the industrial flavor of the neighborhood disappeared. A collection of beautiful homes and buildings of the 18th and 19th centuries remained, but by the mid 1970’s many required extensive repairs or updating. At the same time, a growing awareness of the value of architectural preservation and restoration provided an opportunity for our artisans and carpenters to practice their craft, and to build a business. 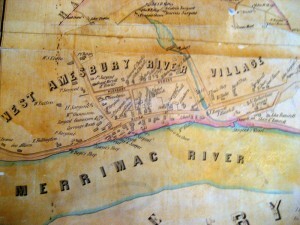 In River Village Carpenters’ early years, antique home repairs and restorations made up much of our work. We developed a reputation for wide-ranging expertise, a high level of craftsmanship, and customer satisfaction. When the 1980’s building boom presented new opportunities, River Village Carpenters’ primary focus became the construction of new homes and additions. Since then, with our network of architects, designers, trades people, and suppliers, we have constructed over forty-five custom homes, and as many home additions. With our experience and resources, we provide maximum expertise, attention, and service to each of our customers. Our commitment to you is a completed project that is beautiful, solid, energy efficient, and long-lasting. Extensive references in the Massachusetts North Shore and Seacoast New Hampshire areas are available.